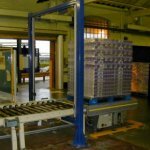 Andrews Automation Ltd have over thirty years of knowledge and expertise in designing and building client specific materials handling equipment throughout the UK. In a time where many clients in the industrial market sector are having to investigate ways of maximising production efficiency, sometimes standard conveyor and palletising systems don’t quite hit the mark. 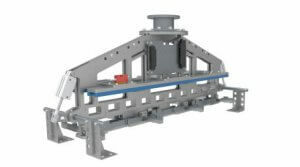 Andrews Automation Ltd have built up an enviable reputation for providing bespoke solutions to all kinds of client quandaries. Working closely with our design team and engineers, clients are able to provide valuable input into how proposed systems will work for them. Our engineers work in CAD and are able to provide 3D simulations of any proposed systems so that clients can be rest assured that every box on their ‘wish-list’ can be ticked. Whether it be an environmental constraint, such as industrial freezers, wash down areas, or food production facilities; or whether it be a difficult product to handle such as unique tote bins, stillages, or manufactured components, Andrews Automation Ltd can find a solution for you. A gripper head specially designed to handle clients tote bins; 4 totes on one side, 3 totes on the other. This allows the system to create the required pallet stacking pattern. 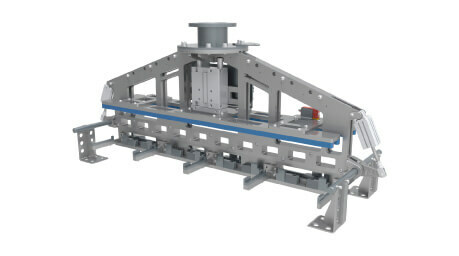 The palletiser head also incorporates gripper feet at each side which allows the robot palletiser to pick and place pallets at the start of the palletising cycle. Andrews Automation Ltd’s engineering facility based in Goole, East Riding of Yorkshire, is home to a team of design and mechanical engineers who work hard on making customer ideas and aspirations a reality. With both a mechanical and an electrical workshop in-house, Andrews’ engineers are able to design, build and test systems prior to despatch and installation meaning that there is minimal disruption to client site operations. 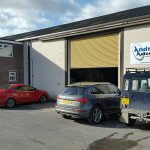 Andrews also take a flexible approach to installation, basing it around client operational needs. Installations can be scheduled around weekends, Bank Holidays or annual shutdowns.